Its first product is the Sentinel RX4100, a 1U rack-mount version of its existing Sentinel DX4000 desktop NAS. The RX4100 is powered by a dual-core Intel Atom D525 CPU with 4GB of DDR3/800 memory, and it runs Microsoft's Windows Storage Server 2008 R2 Essentials operating system. This is a scaled-down version of Microsoft's more robust Windows Small Business Server 2011 product. As such, it can't run full-blown business applications such as database software, but its graphical user interface makes it easy for employees who aren't IT professionals to manage data storage, client backups, share files, and set up remote access. "Small businesses have the same storage needs as the enterprise," said Western Digital's VP SMB Tom Gallivan in a pre-announcement briefing, "but they don't have the people to manage it. We're focused on making it easy for business owners to focus on managing their business versus managing their IT infrastructure." Gallivan said WD chose Microsoft's operating system because "90 percent of small businesses operate on a Windows LAN. With our solution, the customer can have the system and up and running within 30 minutes of taking it out of the box." The RX4100 comes with 25 client computer backup licenses. The device also supports Apple Filing Protocol (AFP), and Mac clients can use it as a Time Machine backup target. "We're seeing a lot of environments where people want to bring their Macs and use Time Machine," said Gallivan. 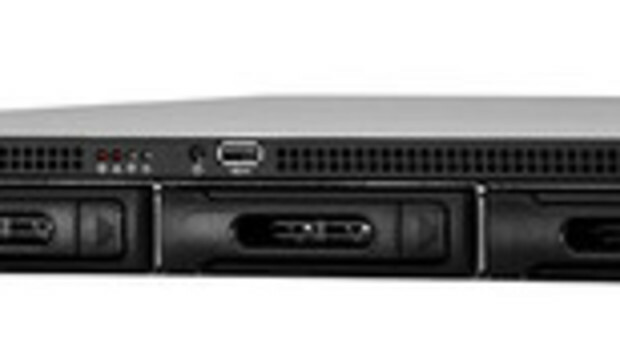 The RX4100 has four 3.5-inch, front-loading, hot-swappable hard-drive bays; two USB 3.0 ports in the back; one USB 2.0 port in the front; a VGA port; two gigabit Ethernet ports (pre-configured for automatic failover); and two power connectors (there's an internal power supply, and an optional external power supply available for failover).